Extreme values can make the calculator go haywire. High scoring examinees generally pass so I never see their essay scores which would help me improve the calculator. On the UBE, the most you can receive for a single MEE answer is 20 UBE points (5% of 400), but with my F18 NY calculator, this occurs with a scaled essay score of 78. Meanwhile, I am aware of examinees who have scored higher than a 78 on the essays, so something else is going on that I don’t fully understand. For the NY UBE, a simple rule of thumb is a score of 20 if you wrote nothing and a score of 80 for a top 99th percentile answer (although this vary by +/- 10). Post-exam worrying about the essays is not productive. For example, the day before the July 2016 UBE exam, a subscriber (foreign examinee) emailed me the following: “You’re probably being swamped by panicking students today (including me), so I understand if you don’t have time to respond. Basically, I’m considering withdrawing from the exam and re-sitting in February because I feel very, very underprepared for the essays portion of the test.” I told this subscriber that it would be a mistake to withdraw (everyone feels unprepared for the exam). The examinee sat for the exam and ended up passing with a 177.9 scaled MEE/MPT score (MBE score of 148.1 and total score of 326). A written score of 177.9 places this examinee’s MEE/MPT scores in the 99.8% percentile among examinees nationwide (meaning just 0.2% of last year's examinees nationwide scored better than this examinee on the MEE/MPT). I later found out that this examinee wrote the 2nd released above average answer to Essay #4 (Secured Transactions), meaning this examinee wrote the highest scoring essay #4 out of 10,296 examinees. Being the highest scoring examinee on the Secured Transactions essay, this examinee received an estimated scaled score of 85 on that essay. This means the examinee needed to average 62 on the remaining essays/MPTs in order to score a 177.9 on the MEE/MPT. In contrast, the failing examines who sent me their J16 scores averaged 44 on the MEE questions and 43 on the MPT questions. So basically, a 180-185 is generally the most you can score on the MEEs/MPTs and MBE, meaning a maximum of 370/400 total score. To date, the highest score I’ve ever received from a UBE examinee is 355 (171 MBE, 184 written). Bottom line, you never know what to expect on the written portion of the exam. Even if you feel “very, very underprepared for the essays portion of the test” as this examinee did, you can still score well on the essays/MPT. Sometimes it is luck (topics you had prepared for appeared) and sometimes it is unexplainable (essay grading is a very nebulous thing). If I were to bring that 55 in E4 to a 65, that 60 to a 65 in E3, and reduce that 60 to a 65, my total scaled score becomes 1430 from a 1428. So, it's better to do similarly well in all essays than do amazing in one and except a big jump. Sorry if this has already been asked, but I looked and couldn’t find it if it has. 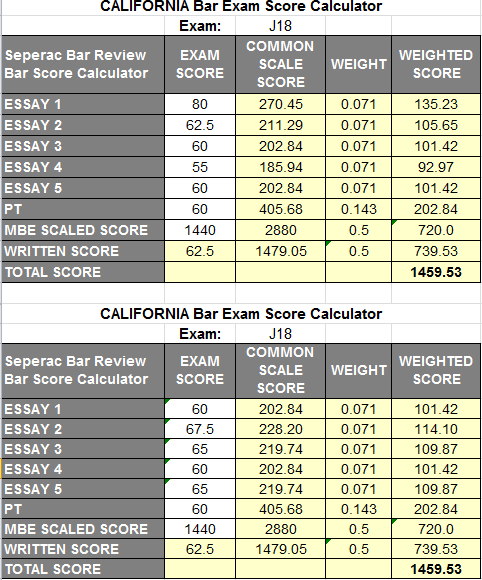 When I type the same raw scores into different states, let’s say 3s for all essays and MPTs and 138 for the MBE, I obviously get different scales scores, depending on the state. For example, in CO, this would be scaled to a 271 and in DC, to a 260. Does this mean that if I’m in a UBE state where the passing score is 260, I statistically have a better chance at hitting the 260 taking it in a state where the scaled score is higher? I encountered a question the other day that has plagued me, so I thought I'd ask the master. The post asked if the scale on the MBE could actually reduce your raw score based on group performance on the equators. I said no, but now I am in doubt. My initial response was based on the idea that the scale could be constructed so that a "reduction" for your group could be already built into the scale. For example, if your group performs equally as well as the previous February and July groups, your scale might begin at an 8, not at a zero. Therefore, a group that "loses" potential scaling points due to poor equator performance never sees points taken off their raw score, they just see less than 8 being added. The range of "negative" scale could be 7-0, but never reaches -1 and nobody is the wiser about what went into the secret sauce. Am I off base, or is that how it works? I've never heard about people losing points off their raw score, but they generally don't release raw scores, do they? This tells me they don't want the peasants looking behind the curtain. Any enlightenment you could provide would be greatly appreciated. In order to know the scale, you need to know the correct mean and standard deviation (SD) for the MBE in your jurisdiction for that exam, along with the MEEs/MPTs mean and SD. I don’t know of any jurisdiction that divulges this information anymore (PA bar exam once reported this information in 2002 and that’s it). If you play around with the calculator and put in a high Essay mean raw score but low Essay raw SD, it will result in a negative scale. Whether this has ever happened in a bar administration, I haven't a clue. What state did you take the exam in? I can let you know their average pass rates over the past 20+ years. That will give you a little more insight into your odds of passing. paperplanes22 wrote: Sorry if this has already been asked, but I looked and couldn’t find it if it has. Yes, that seems to be the case and the evidence supports it. Both DC and CO have the same essay grading scale of 1-6 so the difference can't be attributed to the grading scale. In District of Columbia over the past 23 years, the February ABA First-Timers Pass Rate is 56.8% while the July ABA First-Timers Pass Rate is 76.3%. The February ABA Repeaters Pass Rate is 30.4% while the July ABA Repeaters Pass Rate is 29.4%. In Colorado over the past 23 years, the February ABA First-Timers Pass Rate is 75.8% while the July ABA First-Timers Pass Rate is 83.1%. The February ABA Repeaters Pass Rate is 44.7% while the July ABA Repeaters Pass Rate is 31.5%. An issue you face is that state pass rates may change to prevent forum shopping. For example, NJ had an overall July pass rate of 75% based on the last 20 years while CT had an overall July pass rate of 77% based on the last 20 years. The J18 NJ pass rate was 59% (drop of 16%) while the J18 CT pass rate was 55% (drop of 22%). Personally I think this was done to stop failing New Yorkers from UBE forum shopping (all 3 states are 266). As an aside, if you failed the exam and send me your scores, I will give you a free comprehensive analysis of your scores and it helps me me bar score calculators for other states. I received a 1377 as my scaled MBE score. I tried it again, but I think I may have inputted the wrong numbers. I am getting the same 1428.03 by changing up the essay scores now. I guess the raw written is the final determinative score regardless of the variations between the individual essay scores. Ha! I reckon that's not possible. Primarily because it will undermine the MBE scale being expressed in 200. Unless of course, the 200 scale is just a ruse and the NCBE doesn't really scale raw scores up to 200 as they claim. If we believe, as we are expected to, that the MBE scale is 200, then each raw score/mark/point is worth circa 1.15 scaled points. While I believe for statistical purposes some questions (especially the equators) are more important to the NCBE than other questions, I think it will be greatly arbitral and perhaps misleading to add more point weight to some questions than others. And more importantly, if that was the case, the big prep companies would have been on it too. My apologies if this has already been asked - how does essay grading / scaling work if everyone does really well on essays? From what I have read and heard, pretty much everyone thought the essays were really straightforward, if not easy. Does that mean it becomes harder to pass on the essays, or can everyone actually pass? I am not a stats person *at all*, so please excuse the elementary nature of the question. Also, my state (MO) does not give us a breakdown of any of our essays. We just get two scores: a scaled essay score where the MPT and MEE is combined, and an MBE score. So if your essay score is low, there is no way to determine your weak areas. Way late but just came across this thread and now I'm very curious. I took the July 2016 bar in NY and got a total NY bar score of 341 and scaled MBE of 175.2. Where does that put me? lawgirl3521 wrote: My apologies if this has already been asked - how does essay grading / scaling work if everyone does really well on essays? From what I have read and heard, pretty much everyone thought the essays were really straightforward, if not easy. Does that mean it becomes harder to pass on the essays, or can everyone actually pass? I am not a stats person *at all*, so please excuse the elementary nature of the question. Correct me if I'm wrong anybody, but the way I think it works is a bit like musical chairs. The essays are graded, and the MBE is graded. Then they scale the essays to the MBE by using those MBE scores like chairs in the game musical chairs. The highest graded essays are awarded the points earned by the highest MBE scores. For example, if the highest MBE score is a 178, then the highest grades essays will be awarded a 178. This is why it's so important to focus on the MBE where your life is in your hands. On the other hand, not only are the initial grading of the essays subjective, but there are only so many good chairs (MBE scores) and if they are all taken by the time your essays come to the front of the line, you are screwed. Good morning, Joe. First off, thanks for all you do to keep countless folks semi-sane in the months following the exam. The wait is far worse than the preparation. A few states are releasing scores today. I (and surely hoards of others) am waiting with baited breath for your opinion regarding this administration's mean. Hopefully, your magic machine tells us the scale was more favorable than Feb 2018 . I wish I could answer your question, but I can't. Essay scaling is a very nebulous thing. For example, I honestly think there were two distinct and separate essay scales for the J18 Massachusetts UBE (one for retakers and one for first-time examinees - I would love to get more scores from failing J18 MA examinees to be able to prove this). If you give me enough scores, I can figure out the scale, but as to what criteria is used to determine raw scores, your guess is as good as mine. For example, on the J10 NY pre-UBE exam, Question #3 was a Corporations essay which was rather difficult. Based on the essays I received from 57 examinees, the average answer length for this essay was 542 words with the shortest passing answer to Essay #3 being 347 words long. This is extremely short as compared to normal essay answer at the time. However, for each essay, the bar examiners determine the order of the examinees based on the quality of their answers and then rank them accordingly, which in this case led to very short answers becoming passing essays. Sorry for the delayed follow up. Based on your scaled MBE score of 175.2, your estimated raw MBE score was about 164/175 correct (based on my estimate of the J16 MBE scale). This means you answered about 93.7% of the graded MBE questions correctly. This places you in the 99.1% percentile for the MBE. This means that 0.9% of Jul examinees nationwide did better than you on the MBE based on your scaled MBE score of 175.2 (based on July national data for the past 7 years). Based on a total score of 341, this means your written score was 165.8, which would have placed you in the 93.8% percentile among examinees nationwide (meaning that 6.2% of examinees nationwide would have scored better than you on the MEE/MPT). If you don't mind (and can still remember), how many questions did you answer in practice, from what sources (e.g. Barbri, Kaplan, Adaptibar, NCBE) and what was your overall % correct? I haven't a clue. If what I read was true, the highest essay should match the highest MBE score. We're missing part of the puzzle. As for the lowest scores, if you don't put down anything on your essays, you don't get the lowest MBE score, you get a zero, so that makes sense to me. Maybe Joe can explain this, there's some sort of secret sauce going on here, and I strongly suspect there's a lost of subjectivity from state to state. Maybe if you badmouth the Crimson Tide on your Mississippi bar, you get bonus points? Smiddywesson wrote: I haven't a clue. If what I read was true, the highest essay should match the highest MBE score. We're missing part of the puzzle. As for the lowest scores, if you don't put down anything on your essays, you don't get the lowest MBE score, you get a zero, so that makes sense to me. Maybe Joe can explain this, there's some sort of secret sauce going on here, and I strongly suspect there's a lost of subjectivity from state to state. Maybe if you badmouth the Crimson Tide on your Mississippi bar, you get bonus points? In New York, even if you write nothing for an essay/MPT, you will still receive a scaled score that can range from 5-25. For states like Mississippi, I haven't a clue. You are correct that there is a lot of subjectivity in essay grading. For example, one grader may take nothing off for a wrong conclusion if the analysis is solid while a different grader may take points off. The November 2008 issue of the Bar Examiner stated that essay questions were weak assessment tools: (1) in part because of the inherent limits on sampling; and (2) it is likely impossible to even get score agreement between raters. The process of grading essays is just too complex - one rater may be angered by illegible writing, another by deficient grammar or spelling, another by poor sentence structure, and a fourth by poor arguments and inadequate knowledge. According to the article, the reliability of the MBE scaled score is 0.90. NCBE found that for the essays to have a reliability of 0.90, they needed to be 16 hours long with 32 different essay questions. Thus, you can’t expect reliability in your essay scores when all you answer are 5-6 essays. The current reliability of the MBE is .92 which means 85% of your current MBE score can be explained by your past MBE score. Thus, if you scored 65% or better in MBE practice on representative questions, you stand a great chance at passing. Been 14 years since I past the bar, almost 5 years since I practiced. I'm looking for best advice to get the MBE subjects back in my brain. Any suggestions for relearning (basically from scratch) the material? Thanks so much and of course I don't mind! Least I can do is share what I remember (which is limited). My general approach was to focus on multiple choice, as I had read you can do really badly on the essays and still pass. Plus you can always BS an essay.